From left, Myrle Grate, Children’s Harbor CEO and Hoover Public Safety Charity Foundation Chairman John C. Wingate. Photo by Jordan Wald. 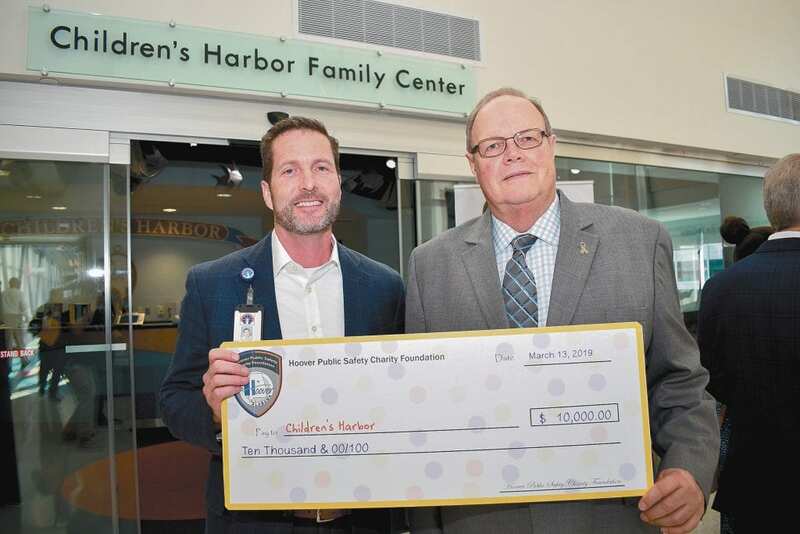 At a recent check presentation, the Hoover Public Safety Charity Foundation presented two donations of $10,000 each to Children’s Harbor and the O’Neal Comprehensive Cancer Center at the University of Alabama at Birmingham. The donated funds were raised at the Night of Laughter comedy event held at the Stardome Comedy Club in October. “We are thankful for the support we received through the Night of Laughter that allows us to make contributions to Children’s Harbor and the O’Neal Comprehensive Cancer Center at UAB. Both of these organizations serve many that are struggling with serious health issues. As public servants, we strive to continue to support those in need within our community,” said Hoover Public Safety Charity Foundation Chairman John C. Wingate, former Hoover fire chief. Children’s Harbor is a non-profit that provides support programs and experiences for critically ill children and their families in Alabama. The organization includes a family center at Children’s of Alabama that offers support services for patients and families and a 66-acre retreat at Lake Martin. The O’Neal center is one of the original eight comprehensive cancer centers designated by the National Cancer Institute and is nationally recognized for its expertise in oncology. The multi-disciplinary cancer treatment and research center consists of 400 physicians and scientists and annually provides treatment to approximately 20,000 patients. Since its founding in 2012, the Hoover Public Safety Charity Foundation has contributed more than $185,000 to local charities. Other recipients have included Camp Conquest, and the American Cancer Society.